ok then.......it explains the fact they're using ballisticast machinery lol. i tried to find their company,but the name is now for sale....seems like their start up fell apart. i'm slowly learning that the key for good boolits is the molds.having a machinist well focused on cutting the best possible molds is a huge +. I tried to go to their website and it is for sale. Apparently out of business. I may be wrong, but I think Mike Sand may be at Prairie Firearms. It is not the coating that fails, it is the alloy that may fail if not correct things are done first. That "Another Guy" would be me. HCL works great with my alloy,it cleans impurities from the bullet surface. Soaking is not a big job at all. I have a ton of alloy from the past and now I can use it. ui'm still trying to figure out a lead catcher without having to mine berms ,so i can get my lead back to me LOL. You need to build a bullet trap that uses an empty Oxy bottle and some steel plate. I have an empty beer gas bottle to make one when I get around to it. For bullet traps I use plastic 5 gal buckets with ground up rubber placed on as stand and shoot into the lid of the bucket. I catch 30 lbs to 40 lbs of bullets before the buckets need to be repaired and the lid replaced. After cleaning out the traps I find the Hi-Tek coated bullets still have the coating intact if they didn't hit another bullet. If you have full coverage in the groove, you are using too much coating. I'm still mining,too. Except a pistol range where we have catchers. Attachment 228301 This my first foray into Hitek coating.I have followed this thread for a long time and read every posting. Thanks to everyone who has contributed. My oven is a domestic wall oven but the bottom element doesn't work. I tried doing 2.5kg at a time but the temperature drop was too much so next batch I reduced to 2kg per time. and it seems to be good. If you follow the instruction exactly you will have success. Last edited by Flintlockrecord; 10-04-2018 at 06:31 PM. I put the 2 fire bricks in the bottom of the oven to act as a heat sink. Seems to help with heat loss. Temperature still drops from 200deg to about 175 when a new tray of boolits is put in but recovers at about 5min. I am measuring temp with a BBQ thermometer that has a boolit fitted over the probe. I too am trying to coat my lube groves, it's only for looks, as they dont touch the barrel so don't need covering. Looks like a 458 SOCOM to me. Great round! Your oven is similar to mine. Do you have an element around the fan at the back? Is there an element at the top? 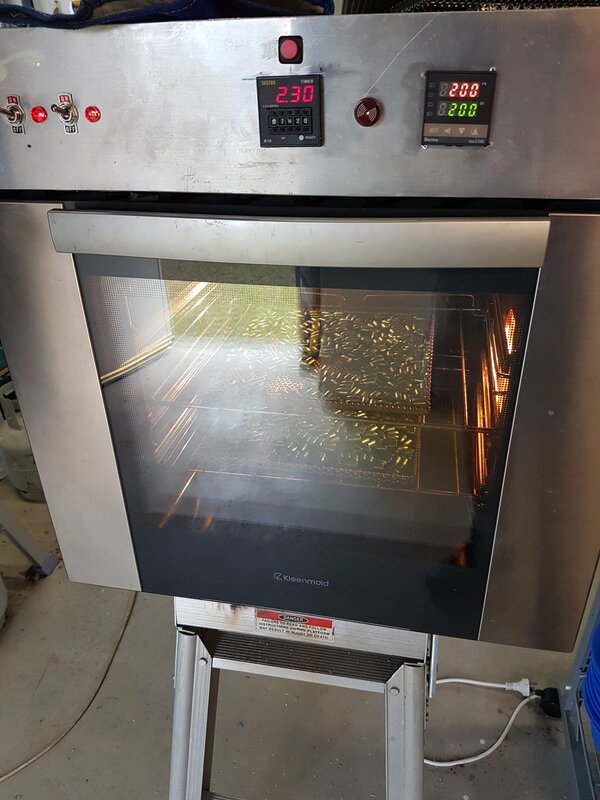 I run both these elements and do 2 trays of 2.5kg each tray in 7 1/2 minutes. Those large brich will interfere with air flow under the tray. use thinner paver blocks and turn them so the run longways front to back with a gap between them. Not sure where the elements are. I'll try the bricks the other way.